Playgrounds.net Blog: How to Select Backyard Playground Equipment? It becomes a tough job for the parents to pick the backyard play sets for kids, when they have multiple options. To make it easier for you, consider the following factors that would help you out in choosing the right play set for yard. 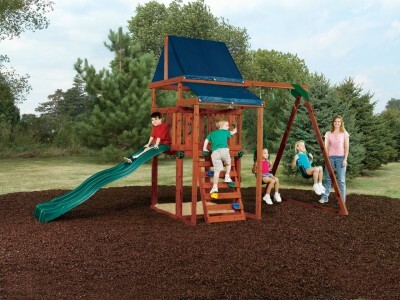 Size – You do not have to worry if you have a spacious backyard as any play set would easily fit into it. But if your yard is comparatively smaller in size then you have to be extra careful while selecting the equipment. Measure the area where you want to install the play set. By this, you will have the idea of the size of equipment you can look for while exploring the options. Quality – Ensure that the maker of your selected playground equipment has International Play Equipment Manufacturers Association (IPEMA) certification. This clearly defines that he deals in offering superior quality backyard playground equipment. Age – If you have toddlers at home, you can purchase plastic play sets. But these are not considered safe for the school goers. An option is to buy strong and sturdy wooden equipment for them. It is built with superior quality wood and can withstand harsh weather condition easily. Safety – Make sure manufacturer has installed all the necessary anchors for the safety of children. Consider that all the pointy edges that can harm them are covered properly in the home playground equipment.